I read a good book recently, y'all -- Fit to be Dead, by Nancy G. West. Let me tell you a little about it. Aggie Mundeen, single and pushing forty, fears nothing but middle age. 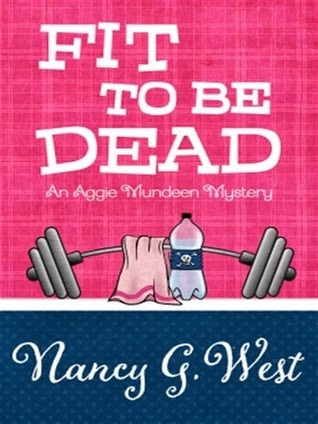 When she moves from Chicago to San Antonio, she decides she better shape up before anybody discovers she writes the column, “Stay Young with Aggie.” She takes Aspects of Aging at University of the Holy Trinity and plunges into exercise at Fit and Firm. Rusty at flirting and mechanically inept, she irritates a slew of male exercisers, then stumbles into murder. She’d like to impress the attractive detective with her sleuthing skills. But when the killer comes after her, the health club evacuates semi-clad patrons, and the detective has to stall his investigation to save Aggie’s derriere. I liked Fit to be Dead,the first book in the Aggie Mundeen Mystery series. Author Nancy G. West has created some interesting, quirky characters, and she puts them through one hilarious situation after another. The main characters are Aggie Mundeen herself (I'll bet you knew that), her friend Meredith Laughlin, and attractive detective Sam Vanderhoven. The only weakness in Fit to be Dead is the implausibility of Aggie's reasons for sleuthing. Aggie thinks that she, an untrained civilian, can detect better than the SAPD. I thought this shows that she has a lack of respect for law enforcement officers, which is surprising since she has secret romantic notions about Sam. Because of this, I deducted one Kitty from my rating. I look forward to reading the second Aggie Mundeen Mystery book, Dang Near Dead, which will be re-released by Henery Press on 9/30/14. I am betting that Aggie's grounds for sleuthing are more logical this time. But will she let Sam know how she feels about him??? Fit to be Dead is an enjoyable cozy mystery, with appealing, engaging characters. The health club setting will amuse anyone who has ever felt awkward or inept as a "newbie" to fitness equipment. I liked it, and I think you will like it too! [Fascinating Side Note: As I was reading Fit to be Dead, several times I noticed brief references to past events involving Aggie with Meredith and/or Sam. Because of this, I felt like I was missing something. I did a little detecting of my own, and discovered that I was missing something. Fit to be Dead is not the first book that Aggie, Meredith, and Sam have appeared in. They first appeared in Nine Days to Evil, a suspense novel in which Meredith is the main character. That's when whimsical Aggie Mundeen cut through the suspense, popped into my head and demanded her own series. The Aggie Mundeen mystery capers were born. Note: I received a complimentary review copy of Fit to be Dead from the publisher, with no expectation of a positive review.